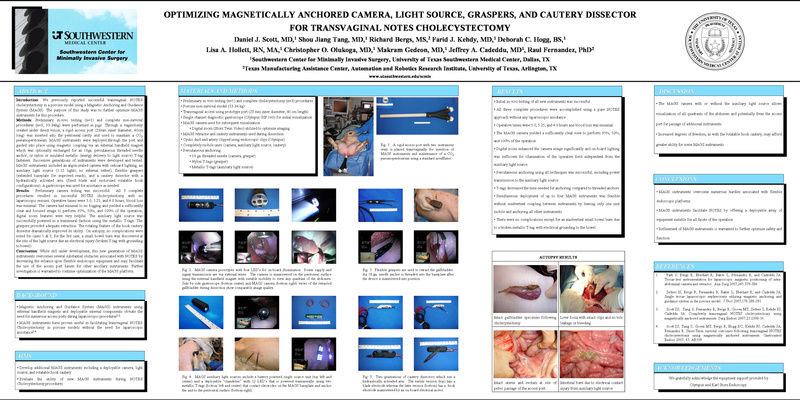 Introduction: We previously reported successful transvaginal NOTES cholecystectomy in a porcine model using a Magnetic Anchoring and Guidance System (MAGS). The purpose of this study was to further optimize MAGS instruments for this procedure. Methods: Preliminary in-vivo testing (n=1) and complete non-survival procedures (n=3, 33-34kg) were performed in pigs. Through a vaginotomy created under direct vision, a rigid access port (23mm inner diameter, 40cm long) was inserted into the peritoneal cavity and used to maintain a CO2 pneumoperitoneum. MAGS instruments were deployed through the port and guided into place using magnetic coupling via an external handheld magnet which was optionally exchanged for an 18ga percutaneous threaded needle anchor, or nylon or insulated metallic (energy delivery to light source) T-tag fasteners. Successive generations of instruments were developed and tested. MAGS instruments included an argon-sealed camera with onboard lighting, an auxiliary light source (1-12 lights, no external tether), flexible graspers (extended baseplate for improved reach), and a cautery dissector with a hydraulically activated arm (fixed blade and motorized rotatable hook configurations). A gastroscope was used for assistance as needed. Results: Preliminary camera testing was successful. All 3 complete procedures resulted in successful NOTES cholecystectomy with no laparoscopic rescues. Operative times were 5.0, 5.25, and 4.0 hours; blood loss was minimal. The camera had minimal to no fogging and yielded a sufficiently clear and focused image to perform 95%, 50%, and 100% of the operation; digital zoom features were very helpful. The auxiliary light source was successfully powered in a transmural fashion using the metallic T-tags. The graspers provided adequate retraction. The rotating feature of the hook cautery dissector dramatically improved its utility. On autopsy, no complications were noted for cases 1 & 2; for the 3rd case, a small bowel burn was discovered at the site of the light source due an electrical injury (broken T-tag with grounding to bowel). Conclusions: While still under development, this new generation of MAGS instruments overcomes several substantial obstacles associated with NOTES by decreasing the reliance upon flexible endoscopic equipment and may facilitate the use of the access port lumen for other ancillary instruments. Further investigation is warranted to continue optimization of the MAGS platform.